Pedagogy (/ˈpɛdəɡɒdʒi, -ɡoʊdʒi, -ɡɒɡi/) (most commonly understood as the approach to teaching) refers more broadly to the theory and practice of education, and how this influences the growth of learners. Pedagogy, taken as an academic discipline, is the study of how knowledge and skills are exchanged in an educational context, and it considers the interactions that take place during learning. Pedagogies vary greatly, as they reflect the different social, political, cultural contexts from which they emerge. Pedagogy is the act of teaching. Theories of pedagogy increasingly identify the student as an agent, and the teacher as a facilitator. Conventional western pedagogies, however, view the teacher as knowledge holder and student as the recipient of knowledge (described by Paulo Freire as "banking methods"). The pedagogy adopted by teachers shape their actions, judgments, and other teaching strategies by taking into consideration theories of learning, understandings of students and their needs, and the backgrounds and interests of individual students. Its aims may include furthering liberal education (the general development of human potential) to the narrower specifics of vocational education (the imparting and acquisition of specific skills). Instructive strategies are governed by the pupil's background knowledge and experience, situation, and environment, as well as learning goals set by the student and teacher. One example would be the Socratic method. The teaching of adults, as a specific group, is referred to as andragogy. The word is a derivative of the Greek παιδαγωγία (paidagōgia), from παιδαγωγός (paidagōgos), itself a synthesis of ἄγω (ágō), "I lead", and παῖς (país, genitive παιδός, paidos) "child": hence, "to lead a child". It is pronounced variously, as /ˈpɛdəɡɒdʒi/, /ˈpɛdəɡoʊdʒi/, or /ˈpɛdəɡɒɡi/. Negative connotations of pedantry have sometimes been intended, or taken, at least from the time of Samuel Pepys in the 1650s. The educational philosophy and pedagogy of Johann Friedrich Herbart (4 May 1776 – 14 August 1841) highlighted the correlation between personal development and the resulting benefits to society. In other words, Herbart proposed that humans become fulfilled once they establish themselves as productive citizens. Herbartianism refers to the movement underpinned by Herbart's theoretical perspectives. Referring to the teaching process, Herbart suggested five steps as crucial components. Specifically, these five steps include: preparation, presentation, association, generalization, and application. Herbart suggests that pedagogy relates to having assumptions as an educator and a specific set of abilities with a deliberate end goal in mind. A hidden curriculum is a side effect of an education, "[lessons] which are learned but not openly intended" such as the transmission of norms, values, and beliefs conveyed in the classroom and the social environment. Learning space or learning setting refers to a physical setting for a learning environment, a place in which teaching and learning occur. The term is commonly used as a more definitive alternative to "classroom," but it may also refer to an indoor or outdoor location, either actual or virtual. Learning spaces are highly diverse in use, learning styles, configuration, location, and educational institution. They support a variety of pedagogies, including quiet study, passive or active learning, kinesthetic or physical learning, vocational learning, experiential learning, and others. Learning theories are conceptual frameworks describing how knowledge is absorbed, processed, and retained during learning. Cognitive, emotional, and environmental influences, as well as prior experience, all play a part in how understanding, or a world view, is acquired or changed and knowledge and skills retained. Distance education or long-distance learning is the education of students who may not always be physically present at a school. Traditionally, this usually involved correspondence courses wherein the student corresponded with the school via post. Today it involves online education. Courses that are conducted (51 percent or more) are either hybrid, blended or 100% distance learning. Massive open online courses (MOOCs), offering large-scale interactive participation and open access through the World Wide Web or other network technologies, are recent developments in distance education. A number of other terms (distributed learning, e-learning, online learning, etc.) are used roughly synonymously with distance education. Critical pedagogy is both a pedagogical approach and a broader social movement. Critical pedagogy acknowledges that educational practices are contested and shaped by history, schools are not politically neutral spaces and teaching is political. Decisions regarding the curriculum, disciplinary practices, student testing, textbook selection, the language used by the teacher, and more can empower or disempower students. It recognises that educational practices favour some students over others and some practices harm all students. It also recognises that educational practices often favour some voices and perspectives while marginalising or ignoring others. Another aspect examined is the power the teacher holds over students and the implications of this. Its aims include empowering students to become active and engaged citizens, who are able to actively improve their own lives and their communities. Critical pedagogical practices may include, listening to and including students’ knowledge and perspectives in class, making connections between school and the broader community, and posing problems to students that encourage them to question assumed knowledge and understandings. The goal of problem posing to students is to enable them to begin to pose their own problems. Teachers acknowledge their position of authority and exhibit this authority through their actions that support students. Dialogic learning is learning that takes place through dialogue. It is typically the result of egalitarian dialogue; in other words, the consequence of a dialogue in which different people provide arguments based on validity claims and not on power claims. An academic degree, Ped. D., Doctor of Pedagogy, is awarded honorarily by some US universities to distinguished teachers (in the US and UK, earned degrees within the instructive field are classified as an Ed. D., Doctor of Education or a Ph.D. Doctor of Philosophy). The term is also used to denote an emphasis in education as a specialty in a field (for instance, a Doctor of Music degree in piano pedagogy). In Denmark, a pedagogue is a practitioner of pedagogy. 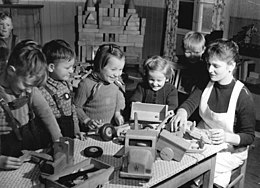 The term is primarily used for individuals who occupy jobs in pre-school education (such as kindergartens and nurseries) in Scandinavia. But a pedagogue can occupy various kinds of jobs, e.g. in retirement homes, prisons, orphanages, and human resource management. When working with at-risk families or youths they are referred to as social pedagogues. The pedagogue's job is usually distinguished from a teacher's by primarily focusing on teaching children life-preparing knowledge such as social skills and cultural norms. There is also a very big focus on care and well-being of the child. Many pedagogical institutions also practice social inclusion. The pedagogue's work also consists of supporting the child in their mental and social development. In Denmark all pedagogues are educated at a series of national institutes for social educators located in all major cities. The education is a 3.5-year academic course, giving the student the title of a Bachelor in Social Education (Danish: Professionsbachelor som pædagog). It is also possible to earn a master's degree in pedagogy/educational science from the University of Copenhagen. This BA and MA program has a more theoretical focus compared to the more vocational Bachelor in Social Education. In Hungary, the word pedagogue (pedagógus) is synonymous with teacher (tanár); therefore, teachers of both primary and secondary schools may be referred to as pedagogues, a word that appears also in the name of their lobbyist organizations and labor unions (e.g. Labor Union of Pedagogues, Democratic Labor Union of Pedagogues). However, undergraduate education in Pedagogy does not qualify students to become teachers in primary or secondary schools but makes them able to apply to be educational assistants. As of 2013, the 5-year training period was re-installed in place of the undergraduate and postgraduate division which characterized the previous practice. An article from Kathmandu Post published on June 3, 2018 described the usual first day of school in an academic calendar. Teachers meet their students with distinct traits. Attributional diversity among these children or teens exceeds similarities. Educators have to teach students with different cultural, social, and religious backgrounds. This situation entails a differentiated strategy in pedagogy and not the traditional approach for teachers to accomplish goals efficiently. American author and educator Carol Ann Tomlinson defined Differentiated Instruction as "teachers' efforts in responding to inconsistencies among students in the classroom." Differentiation refers to methods of teaching. She explained that Differentiated Instruction gives learners a variety of alternatives for acquiring information. Primary principles comprising the structure of Differentiated Instruction include formative and ongoing assessment, group collaboration, recognition of students' diverse levels of knowledge, problem-solving, and choice in reading and writing experiences. Howard Gardner, developmental psychologist from Harvard University and author of 30 books translated into 32 languages along with several hundreds of articles, gained prominence in the education sector for his Multiple Intelligences Theory. He named seven of these intelligences in 1983. These are Linguistic, Logical and Mathematical, Visual and Spatial, Body and Kinesthetic, Musical and Rhythmic, Intrapersonal, and Interpersonal. Critics say the popular theory during the last 20 years is based only on Gardner’s intuition instead of empirical data. Another criticism is that the intelligences are too identical for types of personalities. The theory of Howard Gardner came from cognitive research and states these intelligences help people to "know the world, understand themselves, and other people." Said differences dispute an educational system that presumes students can "understand the same materials in the same manner and that a standardized, collective measure is very much impartial towards linguistic approaches in instruction and assessment as well as to some extent logical and quantitative styles." ^ Li, G., 2012. Culturally contested pedagogy: Battles of literacy and schooling between mainstream teachers and Asian immigrant parents. Suny Press. ^ "Definition of PEDAGOGY". www.merriam-webster.com. Retrieved 2019-01-09. ^ Freire, P., 2018. Pedagogy of the oppressed. Bloomsbury Publishing USA. ^ "Blueprint for government schools. Flagship strategy 1: Student Learning. The Principles of Learning and Teaching P-12 Background Paper" (PDF). Department of Education and Training Victoria. Retrieved 12 June 2017. ^ Shulman, Lee (1987). "Knowledge and Teaching: Foundations of the New Reform" (PDF). Harvard Educational Review. 15 (2): 4–14. Retrieved 12 June 2017. ^ Petrie et al. (2009). Pedagogy – a holistic, personal approach to work with children and young people, across services. p. 4. ^ "pedagogy". Online Etymology Dictionary. ^ "Definition of "pedagogy" - Collins English Dictionary". ^ "pedagogy noun - definition in British English Dictionary & Thesaurus - Cambridge Dictionary Online". Dictionary.cambridge.org. 2012-10-10. Retrieved 2012-10-29. ^ "pedagogue". Online Etymology Dictionary. ^ "Herbartianism | education". Encyclopædia Britannica. Retrieved 2015-11-02. ^ "Johann Friedrich Herbart | biography – German educator". Encyclopædia Britannica. Retrieved 2015-11-02. ^ Kenklies, Karsten (2012-02-12). "Educational Theory as Topological Rhetoric: The Concepts of Pedagogy of Johann Friedrich Herbart and Friedrich Schleiermacher". Studies in Philosophy and Education. 31 (3): 265–273. doi:10.1007/s11217-012-9287-6. ISSN 0039-3746. ^ Martin, Jane. "What Should We Do with a Hidden Curriculum When We Find One?" The Hidden Curriculum and Moral Education. Ed. Giroux, Henry and David Purpel. Berkeley, California: McCutchan Publishing Corporation, 1983. 122–139. ^ Giroux, Henry and Anthony Penna. "Social Education in the Classroom: The Dynamics of the Hidden Curriculum." The Hidden Curriculum and Moral Education. Ed. Giroux, Henry and David Purpel. Berkeley, California: McCutchan Publishing Corporation, 1983. 100–121. ^ Cook, DJ (2010). "Learning Setting-Generalized Activity Models for Smart Spaces". IEEE Intell Syst. 2010 (99): 1. doi:10.1109/MIS.2010.112. PMC 3068197. PMID 21461133. ^ Illeris, Knud (2004). The three dimensions of learning. Malabar, Fla: Krieger Pub. Co. ISBN 9781575242583. ^ Ormrod, Jeanne (2012). Human learning (6th ed.). Boston: Pearson. ISBN 9780132595186. ^ a b Kaplan, Andreas M.; Haenlein, Michael (2016). "Higher education and the digital revolution: About MOOCs, SPOCs, social media, and the Cookie Monster". Business Horizons. 59 (4): 441–50. doi:10.1016/j.bushor.2016.03.008. ^ Tabor, Sharon W (Spring 2007). Narrowing the Distance: Implementing a Hybrid Learning Model. Quarterly Review of Distance Education. 8. IAP. pp. 48–49. ISBN 9787774570793. ISSN 1528-3518. Retrieved 23 January 2011. ^ Vaughan, Dr Norman D. (2010). "Blended Learning". In Cleveland-Innes, MF; Garrison, DR. An Introduction to Distance Education: Understanding Teaching and Learning in a New Era. Taylor & Francis. p. 165. ISBN 978-0-415-99598-6. Retrieved 23 January 2011. ^ a b Kincheloe, Joe (2008). Critical Pedagogy Primer. New York: Peter Lang. ISBN 9781433101823. ^ Kincheloe, Joe L.; Horn, Raymond A., eds. (2007). The Praeger Handbook of Education and Psychology. p. 552. ISBN 978-0313331237. ^ Jones, Leo. (2007). The Student-Centered Classroom. Cambridge University Press. ^ Rogers, C. R. (1983). Freedom to Learn for the 80's. New York: Charles E. Merrill Publishing Company, A Bell & Howell Company. ^ Pedersen, S., & Liu, M. (2003). Teachers' beliefs about issues in the implementation of a student-centered learning environment. Educational Technology Research and Development, 51(2), 57-76. ^ Hannafin, M. J., & Hannafin, K. M. (2010). Cognition and student-centered, web-based learning: Issues and implications for research and theory. In Learning and instruction in the digital age (pp. 11-23). Springer US. ^ Young, Lynne E.; Paterson, Barbara L. (2007). Teaching Nursing: Developing a Student-centered Learning Environment. p. 5. ISBN 978-0781757720. ^ Educational Guide – Denmark Pædagog – UddannelsesGuiden.dk. ^ "Front Page". The Official Site of The Labor Union of Pedagogues. Labor Union of Pedagogues. Retrieved 27 May 2013. ^ "Ezekre a tanári szakokra jelentkeztek a legtöbben [English: These Teaching Areas Proved The Most Popular]". Eduline. 2013-04-19. Retrieved 27 May 2013. ^ "A new pedagogy". Retrieved 2018-06-08. ^ "What Is Differentiated Instruction? | Scholastic". www.scholastic.com. Retrieved 2018-06-08. ^ ASCD. "Understanding Differentiated Instruction: Building a Foundation for Leadership". www.ascd.org. Retrieved 2018-06-08. ^ "Howard Gardner". Harvard Graduate School of Education. Retrieved 2018-06-08. ^ "Multiple Intelligences Theory (Gardner) - Learning Theories". Learning Theories. 2014-07-17. Retrieved 2018-06-08. ^ "Gardner's Multiple Intelligences". www.tecweb.org. Retrieved 2018-06-08. Bruner, J. S. (1960). The Process of Education, Cambridge, Massachusetts: Harvard University Press. Bruner, J. S. (1966). Toward a Theory of Instruction. Cambridge, Massachusetts: Belkapp Press. Montessori, M. (1910). Antropologia Pedagogica. Montessori, M. (1921). Manuale di Pedagogia Scientifica. Montessori, M. (1934). Psico Geométria. Montessori, M. (1934). Psico Aritmética. Piaget, J. (1926). The Language and Thought of the Child. London: Routledge & Kegan. Karl Rosenkranz (1899). The philosophy of education. D. Appleton and Co.
Vygotsky, L. (1962). Thought and Language. Cambridge, Massachusetts: MIT Press.